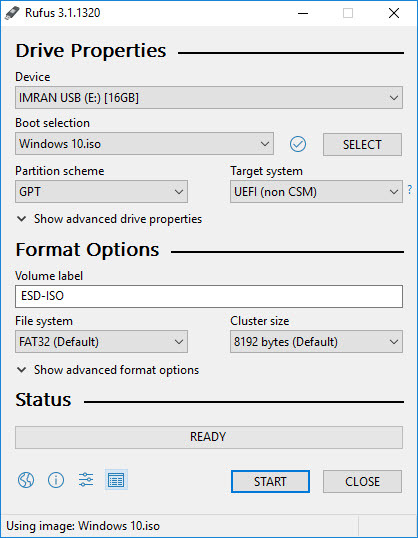 To be able Create a Windows bootable USB from an ISO image we must have a 8GB or higher USB and a Windows 10 ISO image already downloaded on your computer. Assuming that you have the USB and the Windows 10 ISO image, I will explain how we can create a bootable USB media using Rufus. Rufus is a free bootable media creation app. 1. Download Rufus bootable media creation tool. 2. Once downloaded, double-click the downloaded Rufus.exe file to execute the program. It will ask you to check for application updates online. Because you have just downloaded the latest version so click No. 3. Once launched on the top it will ask you to select the USB device, click on the drop-down menu and select the USB drive. The second option is bootable selection, click on the SELECT button and browse to select the Windows 10 ISO file. (Make sure you have downloaded Windows 10 ISO file). 4. Keep the rest of the options as is and click on START button. It will warn you that all of the data stored on USB drive will be destroyed, click ok to proceed. 5. 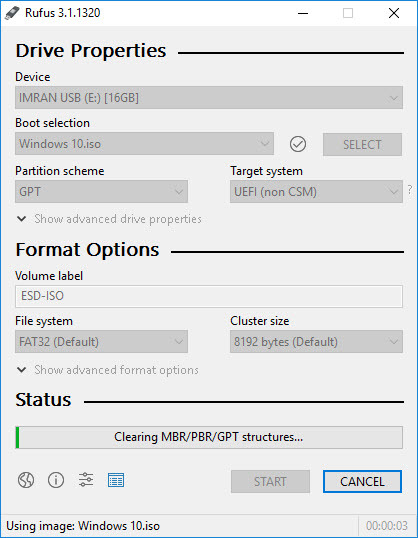 It will now start cleaning the Windows 10 bootable USB drive. 6. 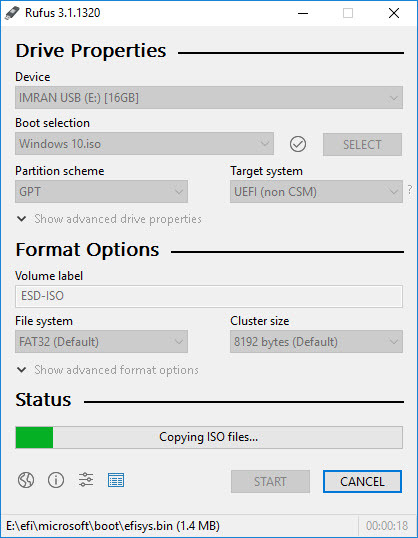 Once the USB drive has been cleared it will start copying the ISO file to the E drive that is where we are creating bootable Windows 10 USB installation media. 7. Once completed, Bootable Windows 10 USB will work as a bootable media for BIOS and UEFI based firmware.